Now here's a whopper - lots of faces I can't remember how many but the novelty had worn off long before I finished it. Printed on canvas and framed 1.2 x 1.2 metres. I underquoted but learned a lot about tackling jobs this size - and doing all the small faces achieved some good 'live' caricature practice. 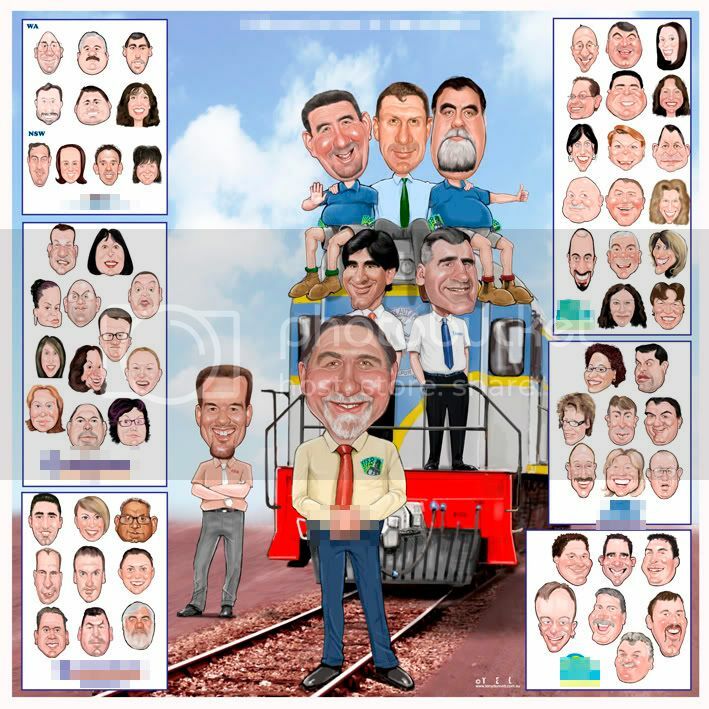 Great job Tel but imho i think the art looses some quality with all those faces flying, it would have been better if they came part of the train. ps: what is that guy doing with his hands?? Thanks Nelson and Ken .... wasn't ideal in many ways to work on - originally started as four main characters and the loco - then three more - then lets have everyone in it !!! Actually one group in another state, who were forgotten, were added on the day of printing. Yep I know all about 'floating heads' but it was the best practical way to sort them into their groups. Two more framed prints of the same size with some more additions have now been ordered - I can see this heading to a strip cartoon. The hands - I'll let you think about that ! wow man, that's amazing!!! you have to email me to tell me how much you charged for that. Well the end product looks fantastic, and one can only imagine the bonanza of potential referrals this would generate! Thanks Jeff - fingers crossed for more referrals - but to be honest I prefer lots of little one's than tackling these whoppers !! !